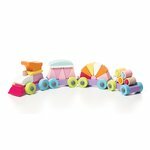 Building blocks enable children to build anything they can imagine. This is your chance to get them interested in STEM toys and develop their construction skills. This experience is fun! Children and adults can play in small or large groups and create whatever they like, also improving their spatial thinking, teamwork and collaboration. 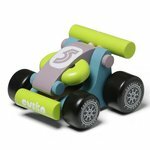 Each set is made of safe materials, and designed to bring you unforgettable fun. 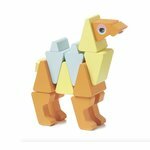 A kit of 21 wooden blocks with firm dual lock fasteners, which provides an abundance of ways to combine the parts in each direction and build new complex structures. Made in Ukraine. 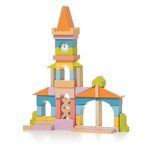 An eco-friendly wooden construction set to assemble a tower. 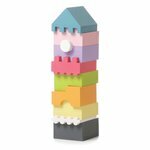 It consists of 10 colourful blocks, which you have to arrange properly to make your tower steady. Made in Ukraine. 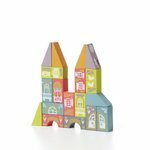 A kit of 14 wooden blocks with firm dual lock fasteners, which provides an abundance of ways to combine the parts in each direction and build new complex structures. Made in Ukraine. 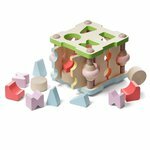 A kit of 22 wooden blocks with firm dual lock fasteners, which provides an abundance of ways to combine the parts in each direction and build new complex structures. Made in Ukraine. An eco-friendly wooden camel toy. It is very flexible and can do acrobatic tricks and change its body position just like a real camel. Made in Ukraine. 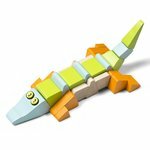 An eco-friendly wooden alligator toy. It is very flexible and can do acrobatic tricks and change its body position just like a real alligator. Made in Ukraine. A 58-piece eco-friendly wooden construction set for building a cool chopper motorcycle. Parts are connected with the built-in magnets. Made in Ukraine. 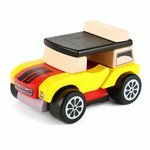 A 13-piece eco-friendly wooden construction set for building a mini convertible. You can make a car with or without a roof. Made in Ukraine. 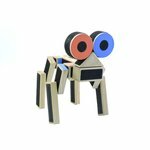 An eco-friendly wooden dog toy. 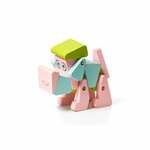 It is very flexible and can do acrobatic tricks and change its body position just like a real dog. Made in Ukraine. 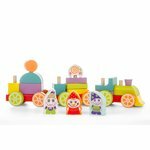 A 33-piece eco-friendly wooden construction set to assemble a train. You can build 4 carts: 1 locomotive and 3 carriages. Made in Ukraine. A 52-piece eco-friendly wooden construction set to assemble a town hall. This building includes a gate and a clock tower like a real town hall. Made in Ukraine. Wooden mini car, that looks like a real go-kart. This model is available in two different colours. Made in Ukraine. 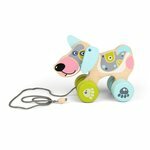 An eco-friendly wooden pull-along dog toy. It has little coloured wheel paws, so it can follow your child everywhere. Made in Ukraine. 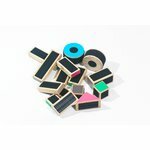 A wooden shape sorter with 8 elements of different shape, size and colour that match certain holes. This model is available in two different colours. Made in Ukraine. 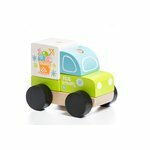 Wooden stacking ice cream truck. Made in Ukraine. Five-piece wooden construction set to assemble a taxi. Made in Ukraine. Wooden construction set to assemble a train. You can put together a multi-colored train having 3 carriages. Made in Ukraine. Wooden construction set to build a magic town. Consists of 18 pieces. Made in Ukraine. 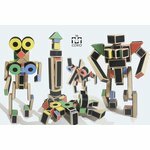 A kit of 36 wooden blocks with firm dual lock fasteners, which provides an abundance of ways to combine the parts in each direction and build new complex structures. Made in Ukraine.